Not My Will (Contre ma volonté) dépeint les périls auxquels font face les jeunes, surtout dans le monde universitaire. 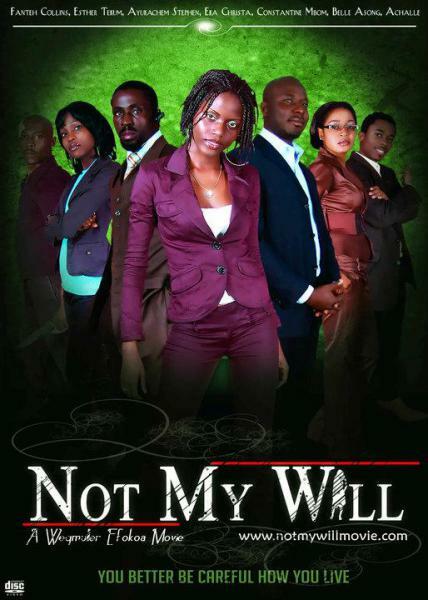 Not My Will is a movie which depicts the perils faced by youths, especially in university environments. At the beginning of the movie, the main protagonist, Nalo, is distressed by a very disturbing dream which plunges her into the hands of Simon, a ‘successful’ scammer who dazzles her with his ill-gotten riches and flashy lifestyle. Unable to resist, she is dragged into a world of ostentatious living without knowing the source of these riches. This causes her relationship with her boyfriend, Weg to undergo some strain. When she finally finds out the source of his money, she is appalled and she humiliates him publicly. Simon is infuriated and is determined to get his dignity restored at the expense of Nalo. Not My Will is also a musical thriller with performances by a great variety of artists in a live musical concert. Painting, another aspect of art which is often under looked in our society is also brought out in the movie through Weg whose father and mother did not like to see him draw and watch any musical channel. He however, finally became a very talented young man.